New Discoveries About Black Holes! On April 10, 2019, the first results from the Event Horizon Telescope (EHT) were announced to the public. This announcement revealed the first ever photograph of the “Event Horizon” around the edge of a Black Hole. Come learn about this breakthrough science! First experience Flandrau’s awesome planetarium show Black Holes: The Other Side of Infinity, then see the new EHT images projected on the planetarium dome and learn about the new discoveries! To engage the public with this milestone in black hole research, Flandrau will offer a limited engagement “Black Holes: EHT Edition” show run from Wednesday, April 10 to Sunday, April 14. To capture an image of a black hole, the international team for the Event Horizon Telescope had to devise a whole new method of “seeing.” In fact, the EHT is not a single telescope but a collaboration among 8 telescopes worldwide that were precisely calibrated to perform as a single massive “Earth sized” telescope – a telescope big enough to capture an image of a black hole’s event horizon. The event horizon is the boundary where light cannot escape the gravitational pull of the black hole, and the forces at the event horizon warp both space and time. We cannot “see” the black hole itself, only the event horizon around the edge. The EHT Project focused on the black hole at the center of our own Milky Way galaxy, known as Sagittarius A* (pronounced “A-Star”), and on a larger black hole in the center of a neighboring galaxy called M87. For the global EHT Project, two of the eight worldwide telescopes coordinated for the project were operated by UA astronomy teams! That means the UA had a major role in this astronomy milestone. To engage the public with the fascinating science of Black Holes and help them understand the scientific significance of the EHT announcement, Flandrau will offer a limited series of special screenings of the fulldome planetarium show Black Holes: The Other Side of Infinity. 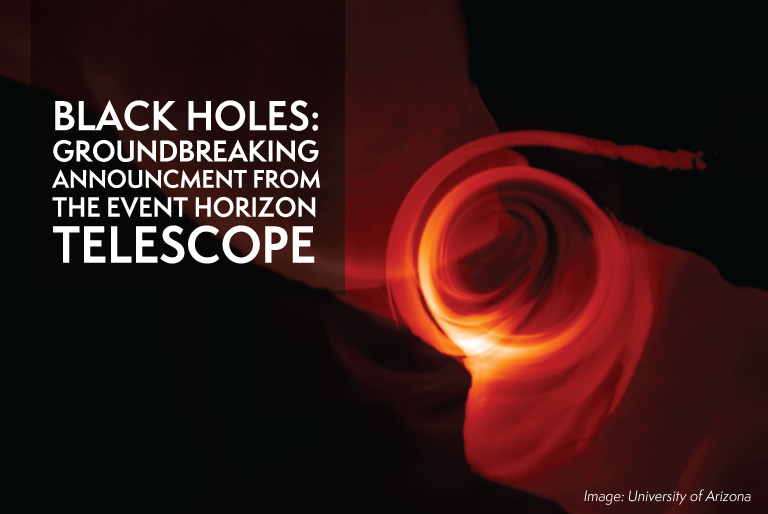 Each screening will be followed by a special presentation about the EHT announcement, including any new EHT imagery of the event horizon, and explain the UA’s role in the EHT Project. Regular planetarium show prices for “Black Holes: EHT Edition,” $8 adults, $6 children, $6 seniors and military. Come join us to marvel at the new discoveries about black holes from the Event Horizon Telescope! Seating is limited, first come, first served. Wednesday, April 10 through Sunday, April 14.